Opening Reception: Thursday, January 17, 2019, 6:00 to 8:00 pm. Free and open to the public. Event Details: A City of Encinitas Civic Art Program juried exhibit featuring 23 contemporary ink paintings by Portia La Touche. "The Tao of Ink" My path to contemporary Asian brush painting" is an exhibit of paintings created in the ancient Asian brush painting manner with a contemporary American art esthetic. 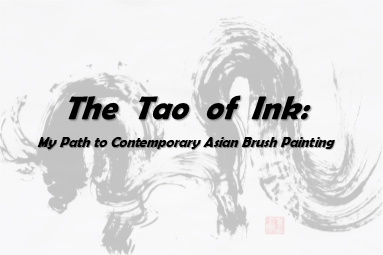 This is my path - or Tao - to reimagine ancient Asian brush painting into a contemporary art form. The push and pull between traditional and modern art create a positive tension and blur the lines between East and West.